MMIR lets you make changes to your Internal Use or Incomplete reports indefinitely. You can also delete these reports. Each time a user edits a report, their initials (based on their MMIR registration name) are assigned to the report and the change is date- and time-stamped. This tracking function is the "paper trail" that indicates which users have accessed the report. 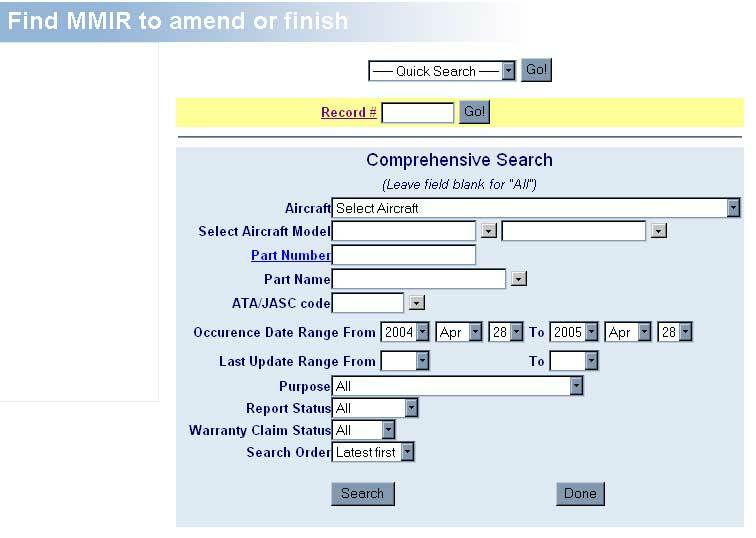 Once a report has been finalized (submitted to the manufacturer or sent to the FAA), it cannot be edited or deleted. However, if you determine that a mistake was made on a report that has already "gone out," MMIR lets you easily submit an amended report. And therein lies the difference between Amend and Edit: you can only Amend an externally-submitted report by generating a new report, but you can edit or delete a report that is Internal Use or Incomplete.
! Tip Don't get worried or confused. MMIR automatically determines whether a report can be edited, deleted, or amended. The search menu appears. Use the Comprehensive Search section to isolate the report(s) you wish to change. If you know you want to change MMIR's from the past few days, you can use the Quick Search feature. The other option, a Record # search, is highlighted in yellow on the screen below. If you happen to know the MMIR Record #, you can enter it here and click Go! Is there a difference? Definitely! From Chapter IX, Creating new reports, we learned that reports can be designated for Internal Use or Incomplete. This simply means that the report is not final, or will not be submitted to any outside entity. Because such a report does not "go anywhere," it can be edited as many times as necessary, or it can be deleted entirely from the MMIR system. Therefore, only Internal Use or Incomplete reports offer the Edit and Delete options. 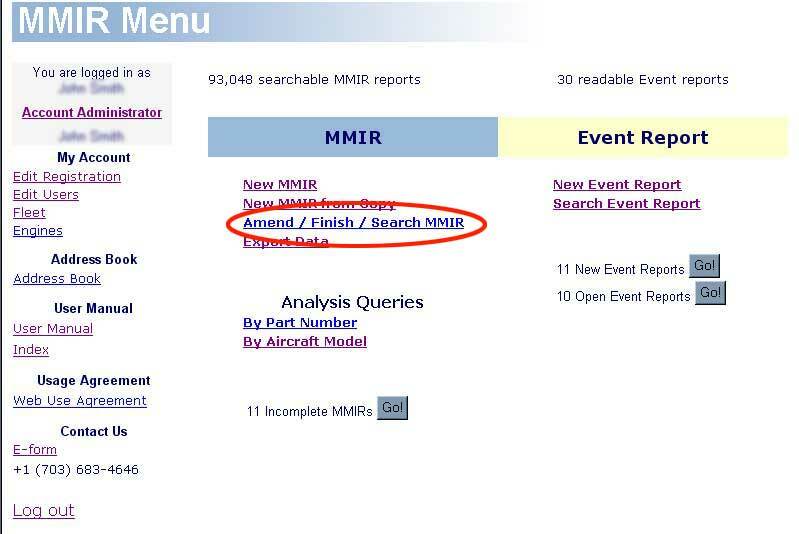 If you used MMIR to submit a claim to a manufacturer, or submitted a SDR or MIS to the FAA, the report is now finalized. You cannot edit a report that has been submitted to a third party (i.e., outside of your company and the MMIR system itself). You cannot delete it, either. But, you do have the option to send an amended report, should it be necessary. So, any report that has been finalized (i.e., submitted to a third party) offers only the Amend option. 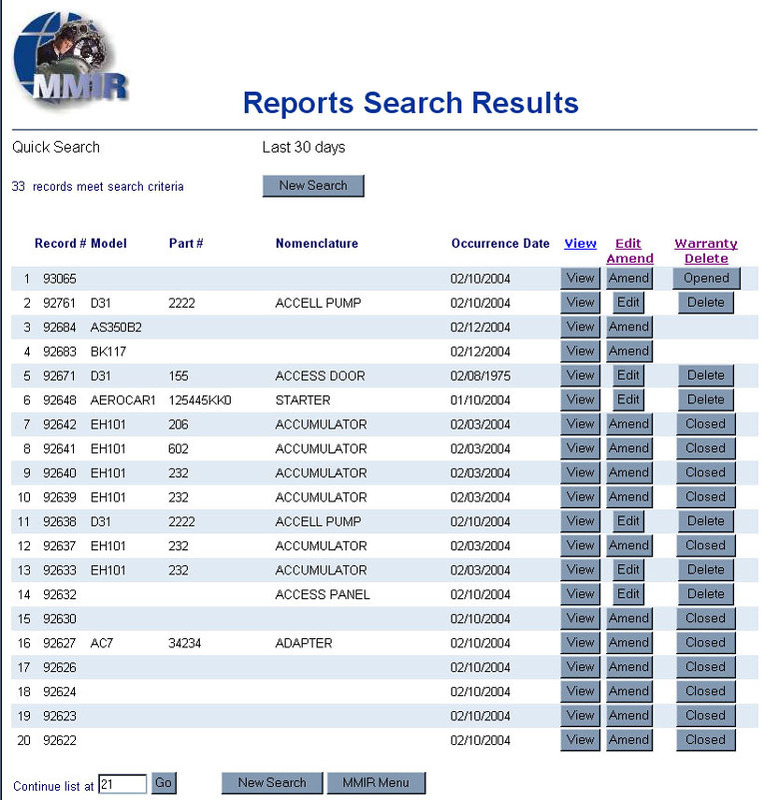 While these reports are instantly collected into the MMIR computer, they are not always sent to the FAA database immediately. There may be a "grace period" of several days after the report is submitted to MMIR before it is electronically sent to the FAA. During this time, you may notice that your SDRs or MISs allow editing and deletion. Once the report is sent to the FAA however, the report is only amendable. Again, you don't have to remember whether you can edit or amend a report; this is an automatic function of MMIR.